If a person is travelling a lot, then he is considered to be lucky. If a person is traveling to Asia often, then he is considered to be even luckier. However, if a person is packing for a trip to Seoul, then he is the luckiest among all. This rising star of the Asia, the capital of the South Korea, Seoul, made what it has now in a short time as 50 years. A lot of disputes, political conflicts are now behind and the 10 million inhabitants in the city enjoy both the social and the physical changes the city has been undergoing. There are many reasons to admire this beautiful city. Its place in the world’s technology market, being on the fourth row among the metropolitan economies around the world may be the business based ones. However, Seoul is a city which has sights to see both in the UNESCO’s World Heritage List and Guinness World Records. This is not something that cannot be come across everywhere, is it? Seoul is not a big city in terms of the land size. The district division is made as North of the Han River and the South of the Han River. Jongno and Gangam (yes, now you know what it actually means!) are two major ones. The first is known as the historical core whereas the latter stands for what we know of modern Seoul. If we were to give a dictionary definition to Seoul, it would have been something close to the ultimate blend of the rooted culture with cutting edge digital era. Although this may create some question marks in the minds at first, all of these will be erased after the first couple of days of your trip. That will also be the day when the feeling of never wanting to go back will surround you. On the northwest of South Korea, Seoul is located on and around the Han River. Get ready for the best airport experience you can ever have. The International Incheon Airport is literally the best airport in the world according to Airports Council International. The transportation to the airport and from it is easy and information can be found on Incheon Airport’s website. Gimpo Airport, on the other hand, is closer to the center but hosts only the flights from neighbouring countries and domestic flights in South Korea. Getting to & getting from Gimpo Airport options are listed in detail on the website. Although Seoul may suffer from heavy traffic jams in certain hours, the public transportation system is designed in accordance with the necessities. Seoul has got the second most used subway system all around the world. This means it is possible to get almost anywhere in the city by using the metro. The map, information about routes and schedule is provided on Seoul Metropolitan Rapid Transit Corporation’s page. Bus is the second most preferred way of transportation in Seoul. It is very well integrated to all the parts and regions of the city. The routes, maps and schedules can be found on Seoul Topis’ website. There are a few things to mention about the taxis in Seoul. There are basically two types of taxis; standard and deluxe. The only difference is in service. Keep in mind; most of the drivers do not speak English, so that may be good to have your destination written in Korean with you. Of course all the cities around the world have got attractions, things to do and places to see however it is really hard to list Seoul’s as the city itself is a giant attraction. Still, the ones below may be good starting points for your trip. 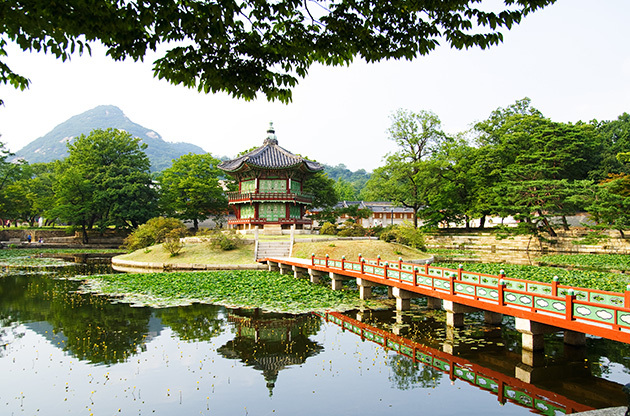 Gyeongbok-gung and Changdeok-gung Palaces should have their place on your list. If you are a nature lover, then Mount Bukhan, Mount Gwanak, Mount Inwang are amazing places to hike. Namsan Park, which is considered to be the symbol of Seoul and 4.19 Memorial Cemetery are worth a visit. Temples and shrines are also provide a good sightseeing, especially Jongmyo Shrine that is devoted to the Royal Family and Jogye Temple. The amusement park in Seoul, Lotte World is a Guinness World Record winner. Horse Racing and casinos are also in demand among the visitors. Korean pottery, martial arts and cooking lessons are highly available across the city if you are looking for once in a life time experience in Seul. Namdaemun is the traditional street market in Seoul where you can find the traditional souveniers and goods. I know you want to see some of those giant electronic shops; then where you should head is Yongsan Electronics Market and Techno Mart. Luxurious brands are located on Myeongdong area. Apgujeong is another similar place, referred as the ‘Beverly Hills of Seoul’. Now you have an idea about the place, right? The ATMs in Seoul usually do not accept foreign cards. Finding yourself without cash may be probable if you don’t make cash planning in advance. There are different types of restaurants in Seoul, answering all types of demands. The dishes I wrote on the South Korean cuisine can be found in most of the places around the center. 24/7 open ones have such a wide menu that it is impossible not to find what you are looking for. When it comes to the night life, let me put it this way; sleeping is for losers in Seoul! The karaoke bars, known as noraebang in Seoul, must be on your list for a unique Korean experience. Make sure to have a beer in the hofs, the western styled pubs. Although ‘booking clubs’ may sound a bit awkward at first, they may turn into extreme fun because the waiters are introducing you to your possible dancing partner for the night. Seoul has always been a great destination to explore. Travelers visit the city to get to know the unique culture that surrounds the city. However Seoul has also got an important place on world’s event tourism that cannot be neglected. Every year thousands of attendees pack their bags to join international conferences, symposiums, congresses, tradeshows, fairs and exhibitions in Seoul. The venues, centers and hotels that turns the city into a hub for these large scale events.